As a mom of 3, I know a bit about getting around with a little one in tow, especially when it comes to baby wearing. Wraps, ring slings, carriers, I’ve tried all kinds of different things. Personally, I don’t find one to be better than the other, but I do have favorites for different stages of infancy through toddlerhood. 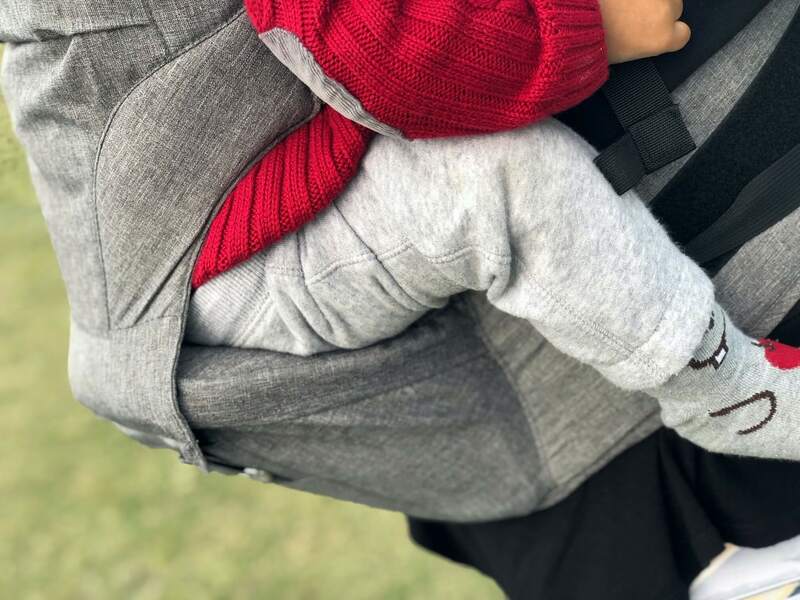 My youngest is currently 8 months old and if we’re out and about (or even need some cuddle time at home), the MOBY 2-in-1 Carrier + Hip Seat is my go-to. 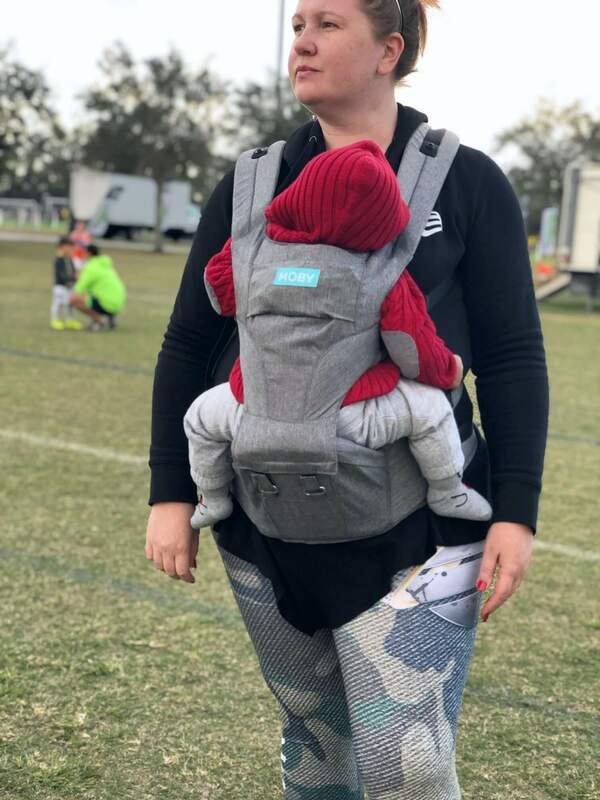 From travel, to days spent at soccer games, to simply cleaning the house, the MOBY 2-in-1 Carrier + Hip Seat is my best friend. First and foremost, this carrier acts as any traditional baby carrier does. 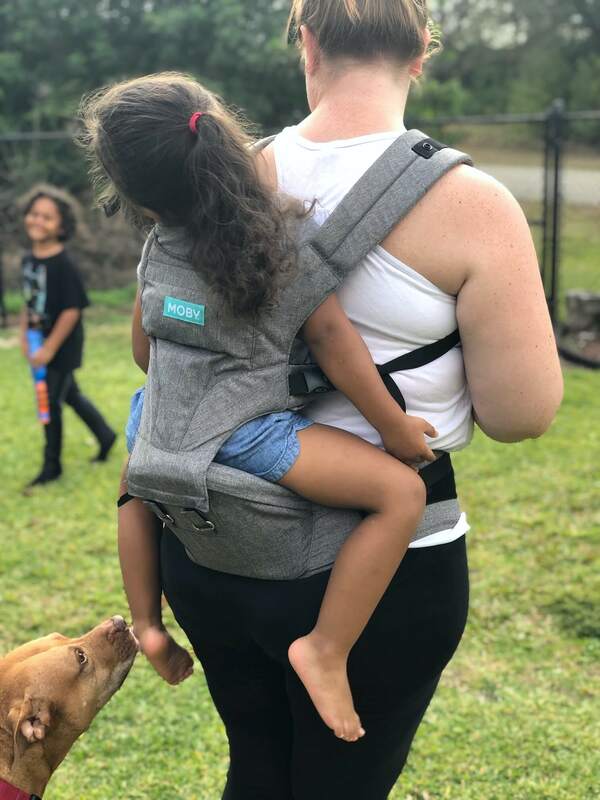 It’s a great way for me to carry my kids in a hands free manner, at the same time providing them with the support and positioning they need to properly grow. Which is my favorite? If I had to choose just one (it’s hard because I love everything about it), I would say the actual hip seat is my favorite. I love the hip seat for so many reasons. For one, I feel like it provides both of us with all the support needed. 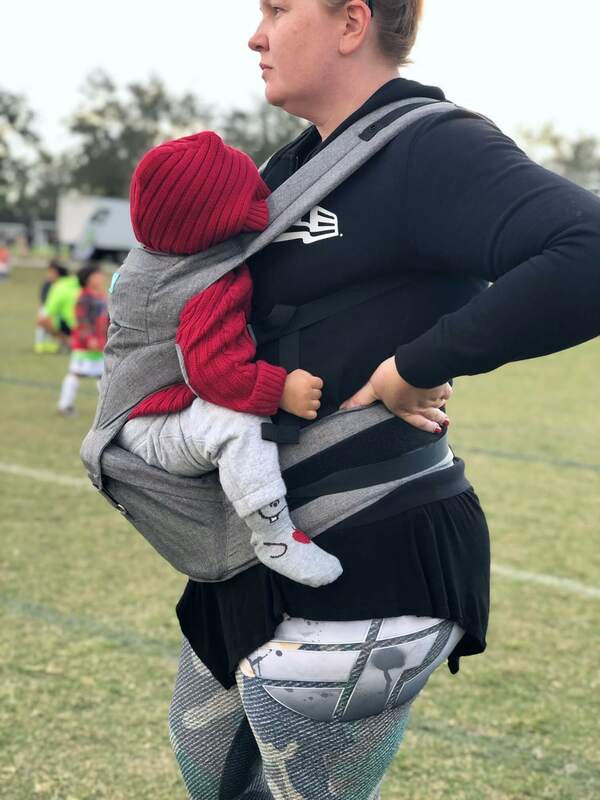 The hard structure is amazing for distributing my son’s weight and it doesn’t kill my body to carry him in the MOBY 2-in-1. Front, back, on the hip, it’s comfortable for me and considering my son loves being in it, I assume it’s comfortable for him. This past weekend my oldest son had a 3 day soccer tournament with 2 games each day, a few hours apart. Instead of driving home in between games, we just decided we’d pack lunches for everyone and stick around watching other soccer matches while we waited for our next. We were on the soccer fields for hours. So I opted to bring my MOBY 2-in-1 along and don’t regret it at all. Not once did my son get fussy and of course he fell asleep for a little while. But even I feel perfectly fine after 3 days of baby wearing. Usually my back and muscles would be killing me. 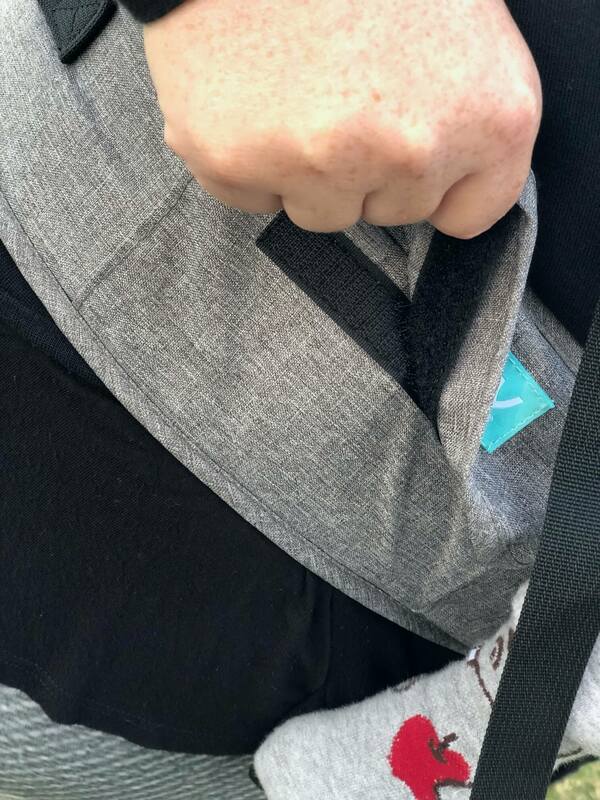 The other thing I love about the hip seat, is that I can use it free from the straps. I can literally detach the back and straps from the hip seat, and use it freestyle (that’s what I call it). All parents know what it’s like to carry a little one around in their arm. It’s hard on the body and after 5 or so minutes, my arm starts to feel like I’ve just done a full workout. I even feel it in my muscles the next day. Freestyling with the MOBY Hip Seat offers plenty of weight support, so the only thing I’m really using my arm for is to keep my son in place. I’m not using my arm to support his little, but hefty, 19 pound body and instead I’m just keeping him steady and balanced on the hip seat. Just the other day, I used the hip seat to hold my son while I was vacuuming. The MOBY 2-in-1 Carrier + Hip Seat is literally an everyday use kind of carrier. 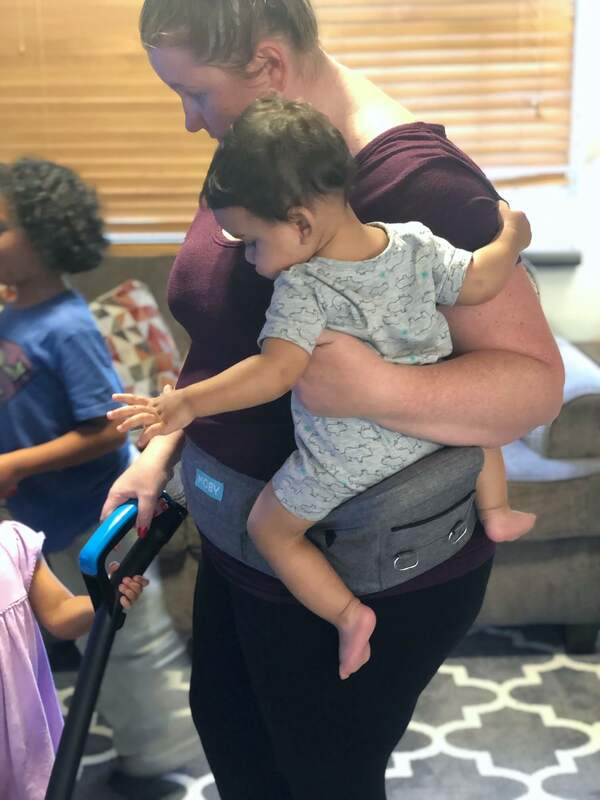 And as for comfort, have I mentioned the MOBY 2-in-1 can be used for kids up to 45 pounds? My 3 year old has her moments where she wants to be held, or if we’ve been walking for a long time, she wants to be picked up and carried. The MOBY 2-in-1 has my back…literally. I adjust the carrier to my back, bend over and have her hop up, get clipped in, and off we go. 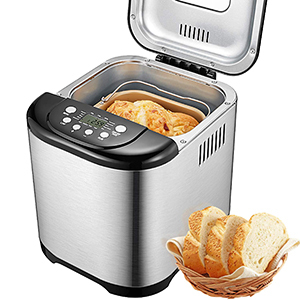 It’s never been so easy to comfortably carry an extra 36 pounds. Since my youngest is just 8 months old, it’s safe to say my MOBY 2-in-1 Carrier + Hip Seat won’t be leaving our family anytime soon. We have years of use left to go! How do you think you’ll most use the MOBY 2-in-1 Carrier + Hip Seat? As a full carrier or freestyling with the hip seat? Stay connected with MOBY on social by visiting them on Facebook, Twitter, Pinterest, and Instagram.